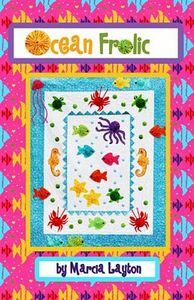 Rickrack, buttons, prairie points and yo-yos add texture and interst to a colorful assortment of sea creatures on this machine applique quilt. Includes full measurements for lap, twin and full size. Finished Sizes: Lap - 54.5x66.5in. Twin - 74.5x86.5in. and Full - 82.5x94.5in.